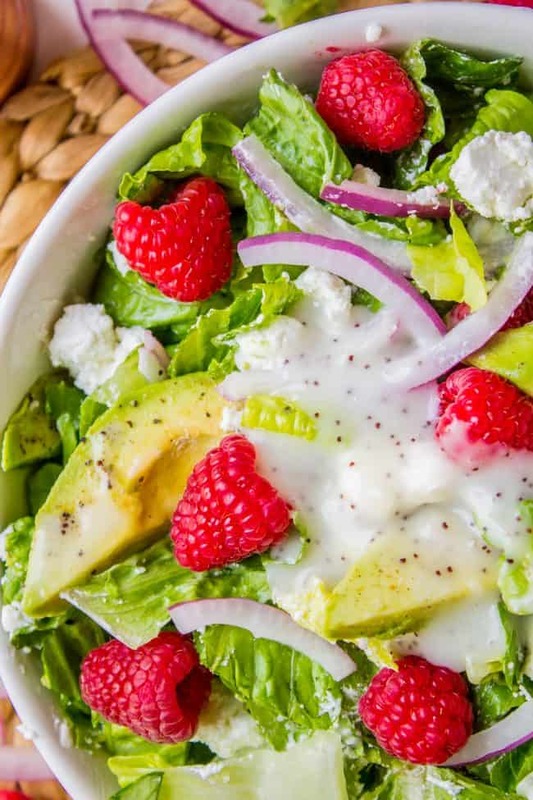 Nothing says summer like this fresh Raspberry Avocado Salad with Poppyseed dressing! This is such a refreshing side dish to go along with your grilled main dish. Or you could even add some roasted chicken to the salad and call it dinner. It’s simplicity at it’s finest! I’ve been trying to change my night owl tendencies into early-morning tendencies, and apparently the only way to keep myself from hitting snooze and crawling back into bed is to threaten myself. So the theory is that when the alarm on my phone goes off at 4:30am, I will see the messages to myself and be so super motivated to get to work! Or something like that. 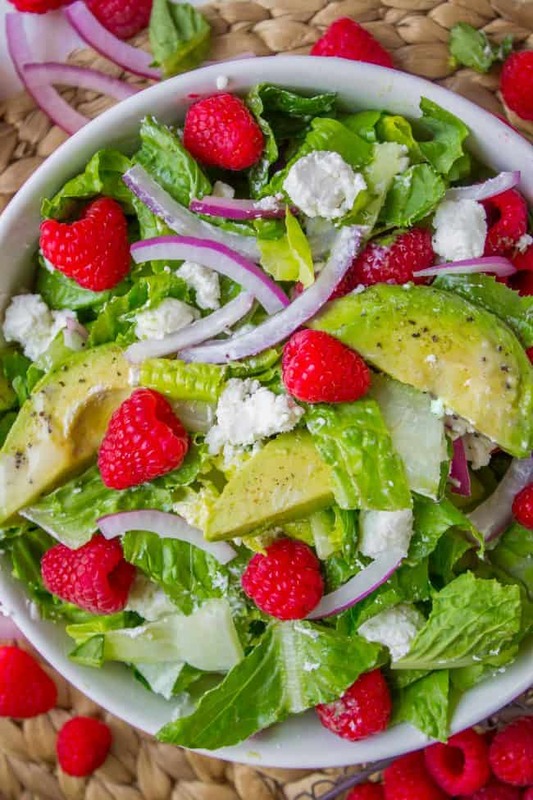 This Raspberry Avocado salad is a winner guys. (as long as it’s not at the crack of dawn.) 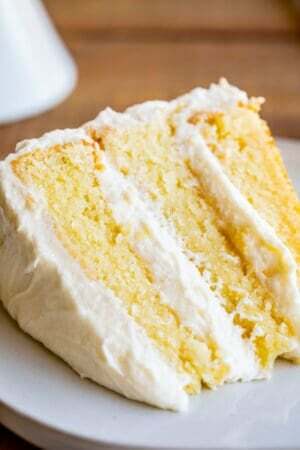 It’s so simple, but all the flavors come together into this amazing party in your mouth. It’s just romaine, red onion, goat cheese, avocado, and raspberries, topped off with some poppyseed dressing. It’s of course endlessly adaptable, just like any salad. Swap the raspberries for blueberries or blackberries. Use butter lettuce or spring mix (or both) instead of (or in addition to) the romaine. If you are not a goat cheese lover, try feta or gorgonzola or blue cheese. But please, don’t skip the avocado. 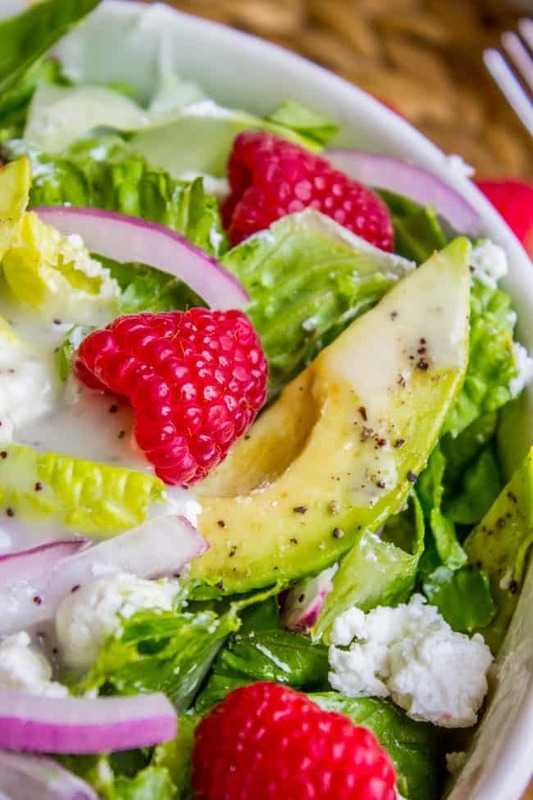 Make it a Blackberry Avocado Salad. Or a Strawberry Avocado Salad. Avocados just make the salad so creamy and add the perfect touch. Squeeze a lemon over the avocados if you have any time in between when you make it and serve it. I love a big green salad alongside grilled food in the summer time. 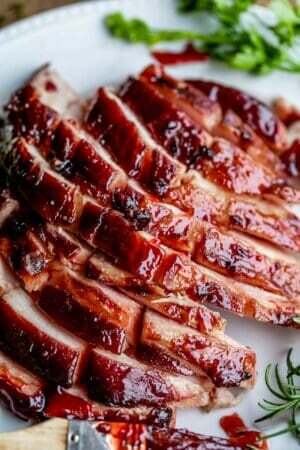 Try this salad with this Slow Grilled Mustard Chicken, or this Grilled Chicken with Spicy Honey Bacon Glaze. 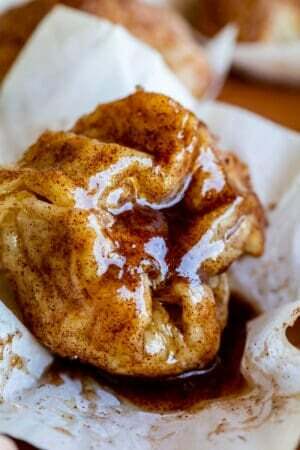 Make some of Aunt Shirley’s Famous Dinner Rolls too! Oh man now I’m hungry. 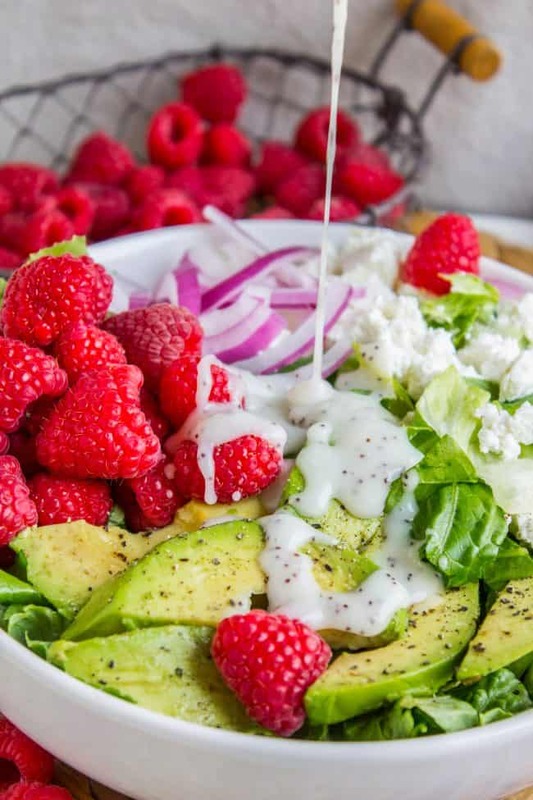 Nothing says summer like this fresh Raspberry Avocado Salad with Poppyseed dressing! 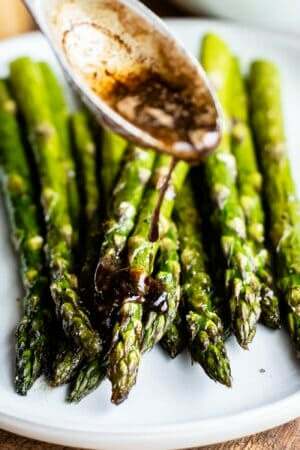 This is such a refreshing side dish to go along with your grilled main dishes. Or you could even add some roasted chicken to the salad and call it dinner. It's simplicity at it's finest! Wash, chop, and dry the romaine lettuce. I love to use my salad spinner for this step! Place in a large serving bowl. Slice the red onion as thinly as you can. You can use as much or as little as you want. Add the red onions, goat cheese, and raspberries to the bowl. You can use as many raspberries as you like. (I bought the huge package at Costco) Toss the salad gently. Slice the avocados and add to the top of the salad. If you have any amount of time in between making this salad and serving it, squeeze a lemon directly over the avocados so that they don't brown. Sprinkle freshly cracked pepper over the salad, especially the avocados. Sprinkle them with a little salt too. You can either serve the salad with poppyseed dressing on the side, or add about 1/3 to 1/2 cup dressing (just eyeball it) to the bowl and toss. This salad goes really well with with Simply Amazing Grilled Chicken Marinade! Add in this Best Potato Salad Recipe and you've got a summer feast on your hands. Instead of using romaine, try using a combo of butter lettuce and a spring mix. You can swap out the raspberries for blueberries or blackberries, etc. If you don't have goat cheese, use feta. 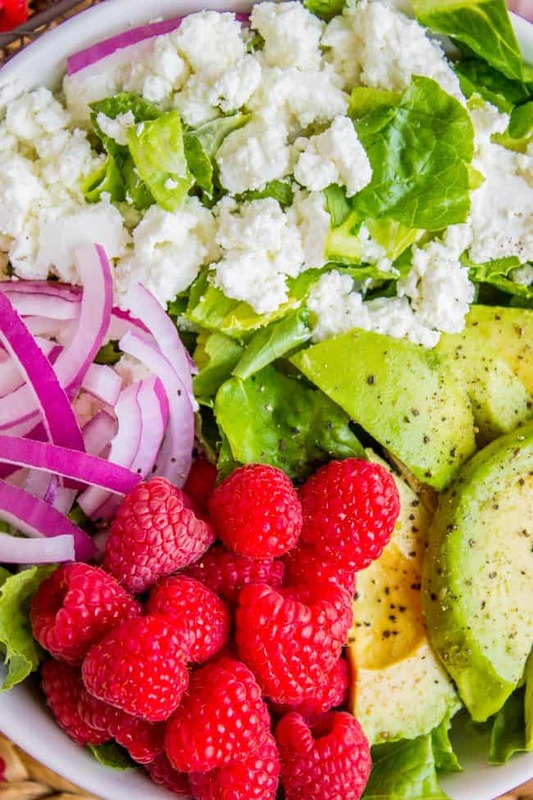 More salads I promise you will love! 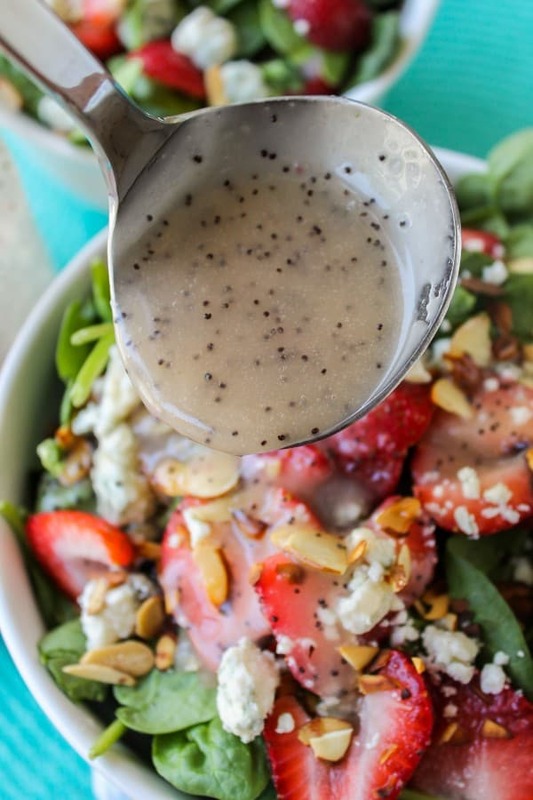 Copycat Cafe Zupas Poppyseed Dressing and Spinach Bleu Cheese Salad << if you love homemade salad dressings, make this poppyseed dressing to go with today’s salad! 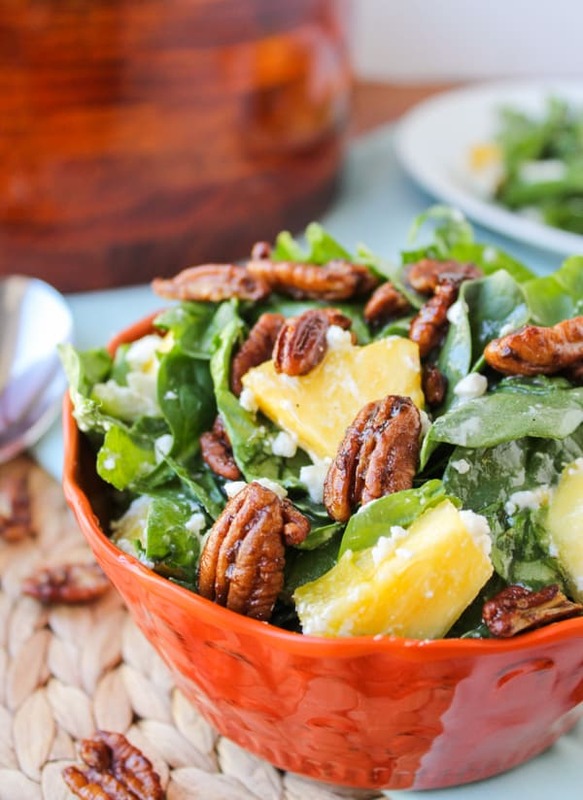 Pineapple Spinach Salad << why limit spinach salad to strawberries?? 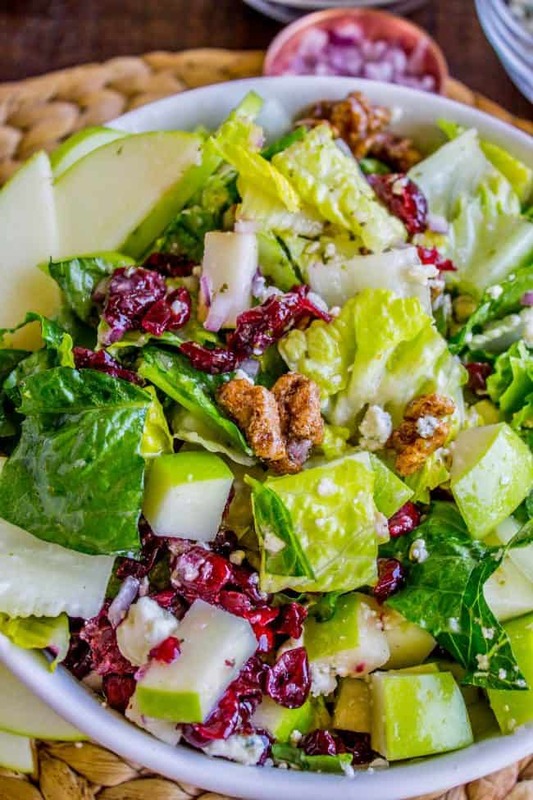 Apple Gorgonzola Salad << just like the one from Buca di Beppo! I love this salad! 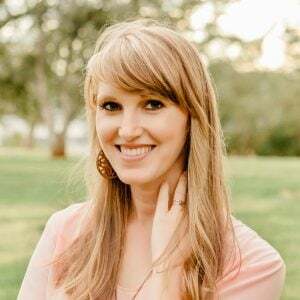 More salads from blog friends that you will love! My husband and mother-in-law LOVED this salad! They complemented me numerous times! I used feta cheese instead of goat cheese. This is definately a winner! Thanks for the receipe! I’m so glad everyone liked the salad Tina! Feta is the perfect substitute. Thank you so much for commenting with a review!